I do not know where my daughter got this idea from but I think it is great. 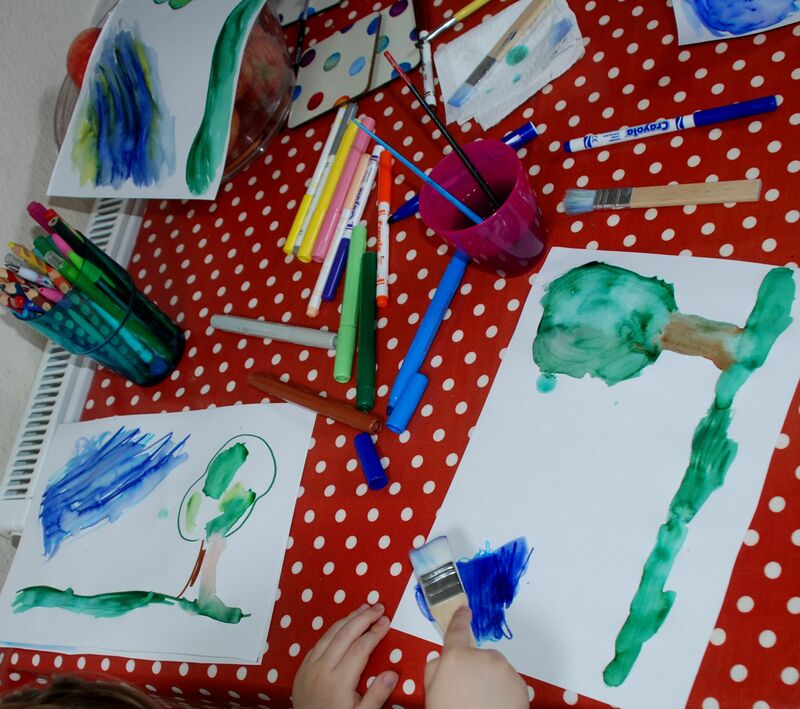 We have been doing a lot of water-colour painting lately but today my daughter used her felt tip pens (marker pens / Kokies) to draw a picture and then she used a paint brush to add some water and voila she had a brilliant water-colour painting. One of the things that I love about these pictures is that you only need a basic picture to start with. This means young kids can create a really great looking picture. This was a big plus with my son. As soon as he realized he could make one he sat down and ended up doing three different pictures. This is the very first one my youngest tried. 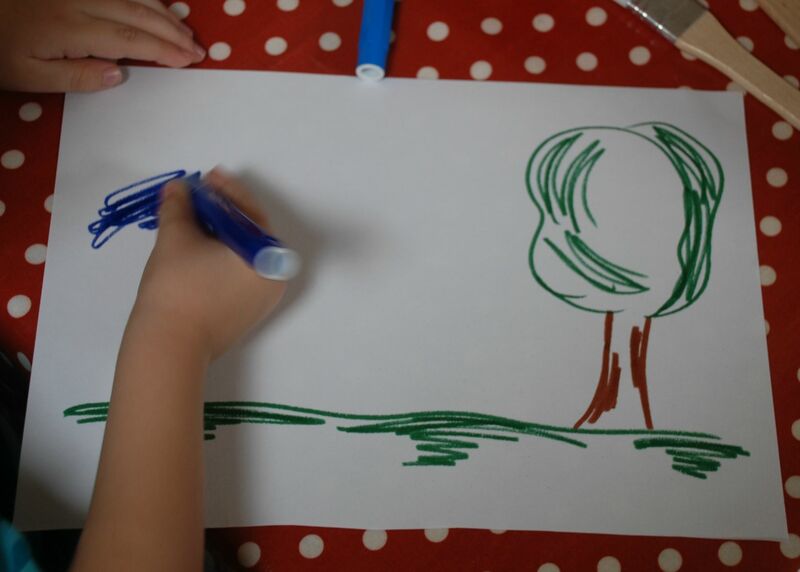 He asked me to do a tree outline for him and then he did the rest. I can not actually remember when I last saw him sit for so long doing page after page. 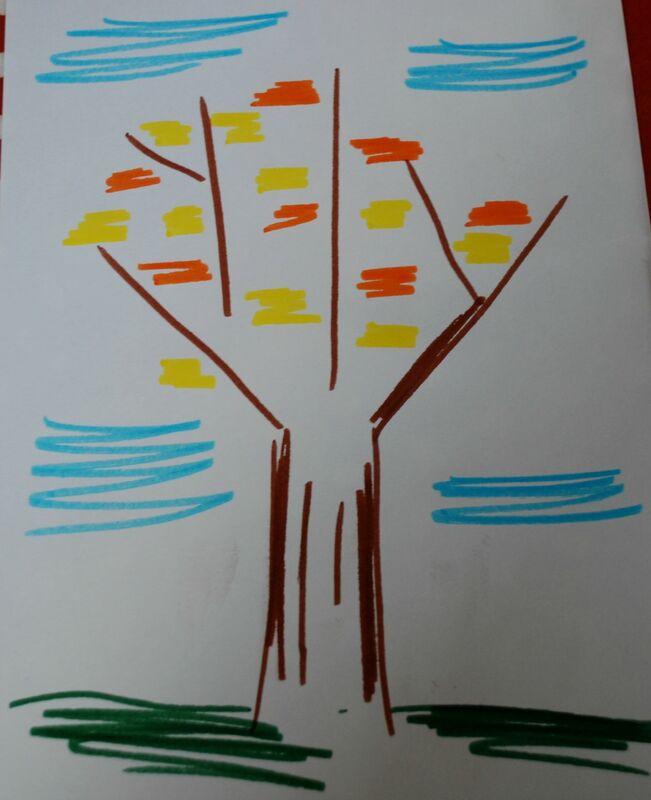 My daughter has already noticed that some of the leaves in our garden are starting to change colour (so she informs me) so she did an autumn tree. And I know I am biased but I do just love the end result. I am already thinking I might suggest we try this method for a few birthday cards that we need to make soon. 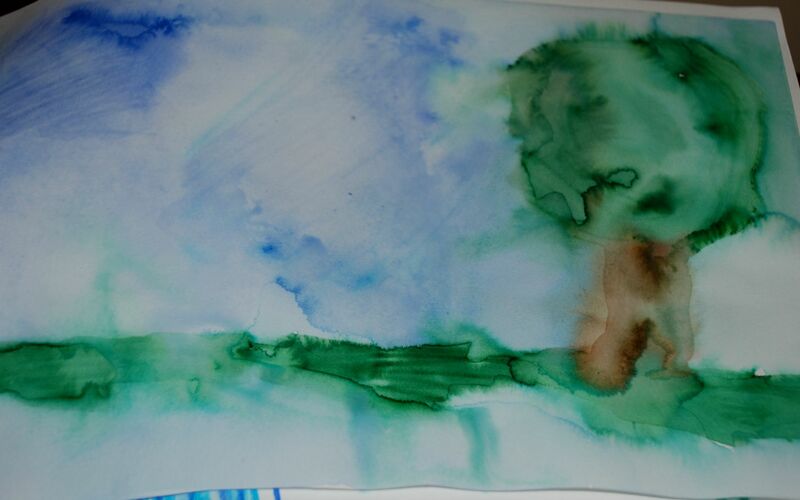 If you try this at home it is best to use card or water colour paper. For the felt tip pens we used some no-name brand ones and some Crayola markers, both worked really nicely. Don’t use the Ikea markers for this, their colour does not run nicely when the water is added. 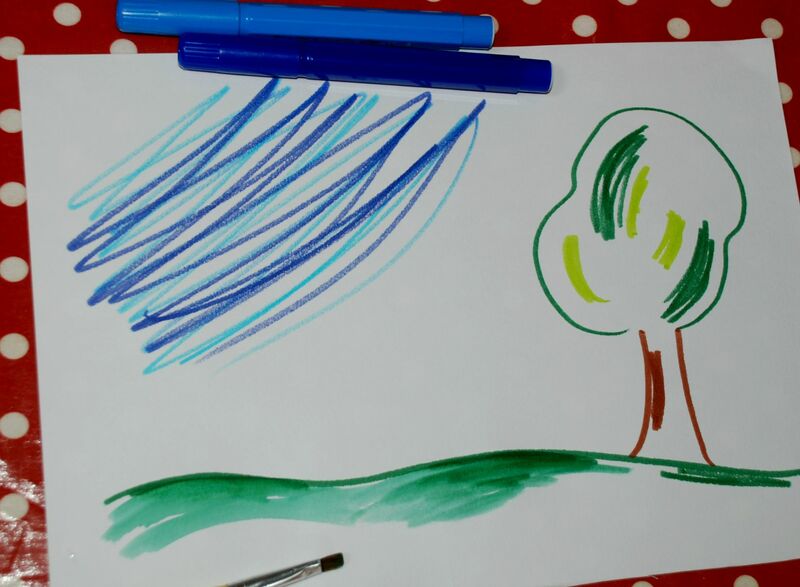 A later note – after doing this a lot more we have discovered that our favourite marker pens for this activity are these – Carioca Jumbo (affiliate link). 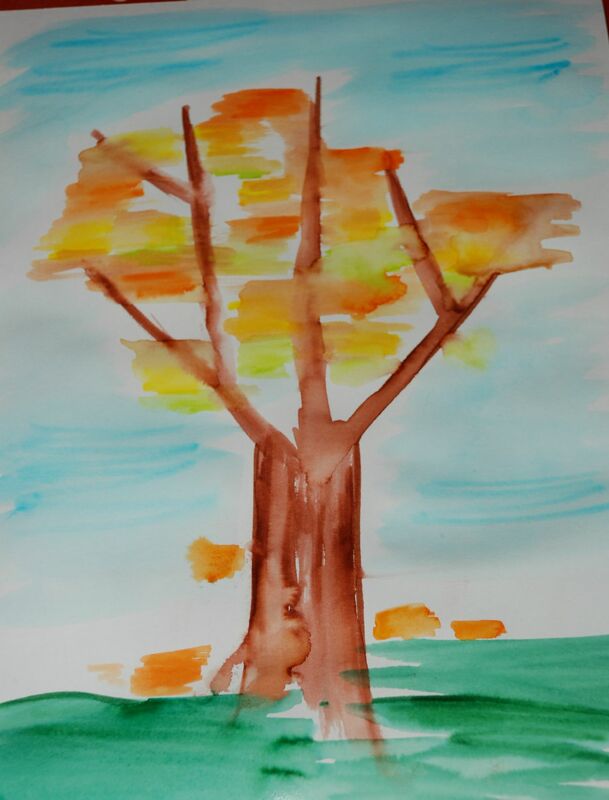 This entry was posted in Art and Craft Ideas and tagged Autumn crafts, Autumn tree, children's art, children's craft, home ed, homeschooling, water colour effect. Bookmark the permalink. What a terrific effect. What paper and markers did you use? I can’t imagine printer paper having such a lovely watercolour effect, or am I mistaken? Definitely going to do this with my little one. I’ve never seen this before. It’s really effective! This is the first time I’ve come across any info on this painting method. It’s a bit of a best kept secret. I discovered it by chance. My normal medium is oils and acrylics. I do a lot of hand painted reproductions of paintings by the old masters, Monet, Van Gogh, Cezanne and the like, but can get terrific results using this process, and it’s so quick and so much fun!! 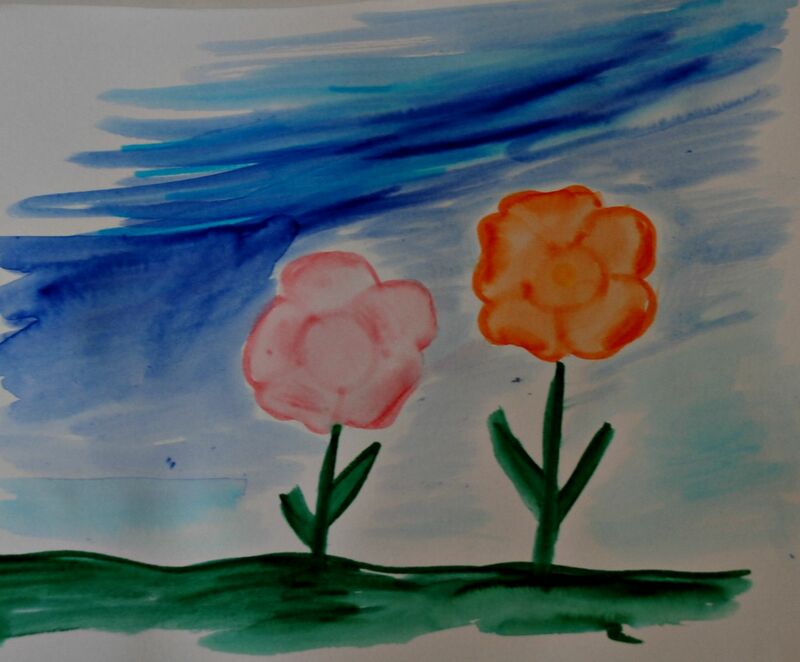 I can come up with a pretty good version of Monet’s “Water Lillies” in about 15 minutes using felt tip pens and water! I only wish my efforts sold for as much as his do! You can see some of the results I’ve achieved using felt tip pens and water on the website I’ve mentioned in the details I was asked to supply, in order to post this.